I’m briefly interrupting my painfully slow revelation of the York Toy Show toys to feature a seasonal, Christmas toy. I wanted to show you all a bizarre, freaky, strange Christmas toy like I did last year, but nothing really compares to a gyrating Mr. & Mrs. Claus in the bathtub. I went to Wilsons 5¢-$1.00 to hopefully find something freaky again, but I had no luck. (I did see some more of the singing bathtub Clauses if anyone out there want’s one.) Plus, I’ve been pretty busy lately, so I haven’t had a lot of time to go searching for Christmas toys. Eventually, I remembered that I already have some Christmas toys. I actually brought them to work years ago around Christmas time so my desk would be more seasonally festive (instead of scary). They’d slipped my mind, because I actually ended up lending the toys to my friend Megan (since my desk was so crowded and hers was so boring 😉 ), and they’ve lived at her desk for at least two years. Maybe it’s not what you expected, but the toys I’m referring to are from the Rudolph and the Island of Misfit Toys toyline by Playing Mantis. They debuted years ago… probably 2001. 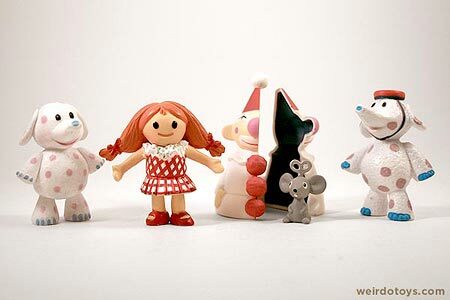 They’ve been re-released over the years by a different company I think, because the quality of the toys seems cheaper. Cheapy plastic and paint jobs. My immediate thought was “I’ll feature the Bumble.” He’s cool, and I remember being scared of him as a kid. 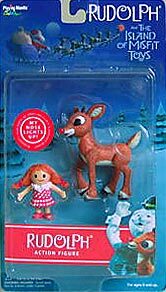 Then I thought, it’d be cool to feature some of the Misfit Toys that come packed along with the other figures from the toyline like Yukon Cornelius, Santa and Rudolph. Well, after setting them out to photograph them, I felt like they worked “conceptually” for the blog, but they are too visually boring or uninteresting to feature (so, I’ve included a photo, just to show you that you weren’t missing much). The Bumble is cooler than those misfits. He’s big, plastic and covered in white fur. He looks great. Is it just me or does he seem more cute, huggable and sane in this toy likeness? I think it was his whacked-out expressions, sharp teeth and roars that freaked me out as a kid. It seems like that’s been toned down a bit. They made him shorter and chubbier than he actually is in the animated classic. It’s been years since the cartoon, so I guess he’s been putting on the pounds since then. His jaw even moves slightly, but not enough to make it look like he’s talking or anything. It’d be kind of neat (but totally unreasonable) if the figure had removeable teeth like the cartoon. Maybe they’d snap in and out or something. You remember when Yukon pulled them all don’t you? It seems pretty damn raw/cruel now that i think about it, but as a kid, a toothless Bumble was a friendly Bumble. I couldn’t find any clips of the old Rudolph Cartoon I liked on YouTube, but I did find this little gem. The intro does nothing for me, but the Bumble section makes me smile. Enjoy, and have a Merry Christmas everybody (even though I just gave you a disappointing Christmas entry). of new finds. I look forward to your new posts in the coming year. 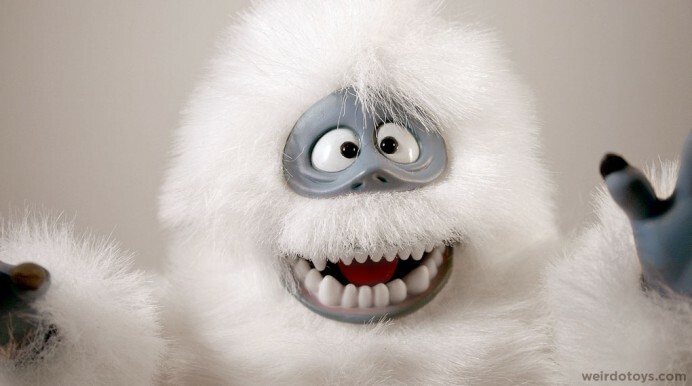 Bumble scared me as a kid too. Even now, I have some trepidation of watching Rudolf the Red Nosed Reindeer, because of Bumble and how mad I always got at the other Reindeer, AND SANTA!! They were all so mean! 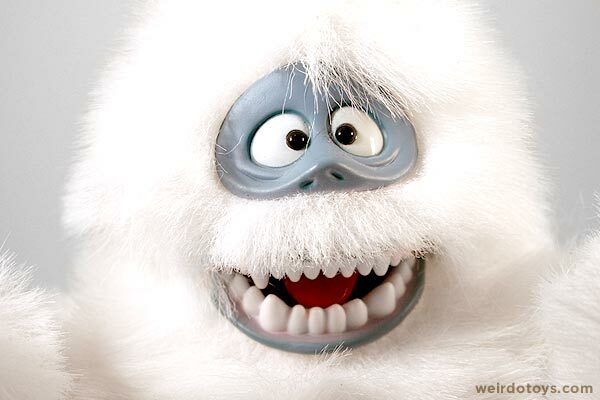 Seeing the Bumble toy though, it makes me want to rethink my dislike. He is pretty cute in the pictures. (What do you use as a setup for your pics?) He reminds me of the ‘Into the Wild’ toys that have become popular again. Have you seen those? Great Xmas Toy. I wish i got this guy when i had the chance. I agree with Sherrie with the rest of the reindeer and Santa being so cruel to the misfits. No way a Christmas movie would be made like that again. Not PC enough. For the sake of being annoying, I must correct your statement about the Bumble teeth removal. Having a three year old, and having watched the Rudolph movie with him about 35 times over the last two years, it is Hermey who does the teeth-pulling. Yukon does the prep work by dropping a gigantic boulder on the Bumble’s head to knock him out. Either way, it IS cruel as hell and i feel sorry for the Bumble every time I see that part. So so cruel. Keep up the great work. Merry Christmas! 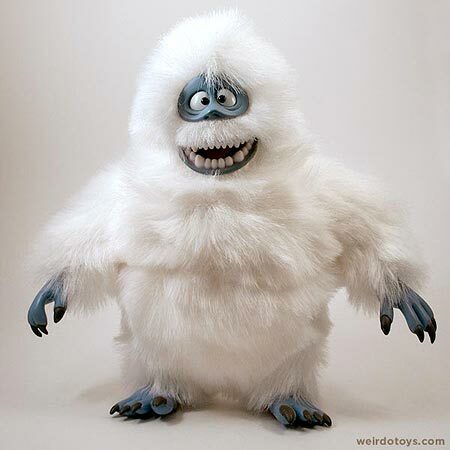 @ Sherrie – Yeah, the Bumble is pretty cute in the toy version. Also, for my pics setup, it’s just a simple light box studio thingy with two small lights. on either side. It was a cheapy studio light set I bought at Wal-Mart months ago. Seems to work well for my smaller toys. If you ever see it again, say, on walmart.com you ought to uh, make a post… 🙂 I need something like that and all of them I see are very expensive. Whenever I was researching portable light studios, I found a decently priced one at amazon.com. I decided to check Walmart.com and noticed I could visit my local Wal Mart to buy one. Luckily for me, They were on clearance, so I got mine 50% off. I think I ended up paying $20 for it. It came with the light box, backdrop, two lights with bulbs and a mini tripod. Here’s the same photo studio set on Amazon. Oh, by the way. I bought brighter bulbs eventually, because the ones they came with were kind of wimpy. I also just use a white piece of poster board instead of the blue/gray fabric backdrop that comes with the set. Trust me, its not ALL of your secrets. 🙂 I just lack the ability to build my own and am too cheap to pay too much. 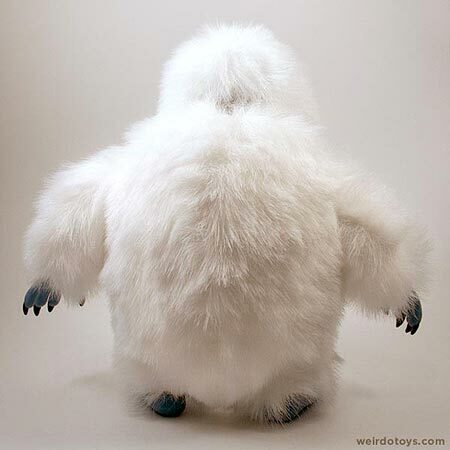 The Abominable Snowman (aka http://t.co/XgE3J4pe Watch this YouTube clip – well worth it!